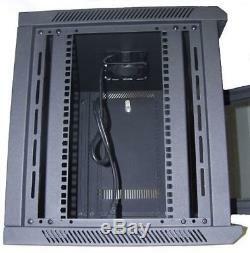 Wall Mount Cabinet Rack with Locking Glass Door - 6U. Dimensions: 14.5"H x 21"W x 24D. 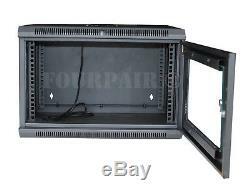 Enclosure fits standard 19 rack-mount equipment. Maximum rail depth of 20. Total front to back useable space of 22. 2 removable side panels with key locks. Locking Glass Door that can be installed to swing open either left or right. 2 pairs of square hole mounting rails with cage nuts kit included. Top of the cabinet includes an already installed cooling fan w/110V power cord (120 x 120 x 38mm). Top and bottom open brackets for easy cable & wire access. Venting slots througout to help keep equipment cool. 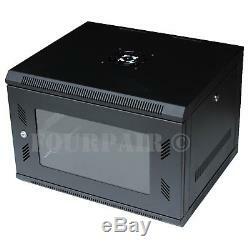 The item "6U Wall Mount IT Server Network Cabinet Data Rack Locking Glass Door 24 Deep" is in sale since Friday, January 26, 2018. This item is in the category "Computers/Tablets & Networking\Enterprise Networking, Servers\Racks, Chassis & Patch Panels\Rackmount Cabinets & Frames". The seller is "fourpairteledata" and is located in Arkansas. This item can be shipped to United States, Canada, United Kingdom, Denmark, Romania, Slovakia, Bulgaria, Czech republic, Finland, Hungary, Latvia, Lithuania, Malta, Estonia, Australia, Greece, Portugal, Cyprus, Slovenia, Japan, China, Sweden, South Korea, Indonesia, Taiwan, South africa, Thailand, Belgium, France, Hong Kong, Ireland, Netherlands, Poland, Spain, Italy, Germany, Austria, Israel, Mexico, New Zealand, Philippines, Singapore, Switzerland, Norway, Saudi arabia, Ukraine, United arab emirates, Qatar, Kuwait, Bahrain, Croatia, Malaysia, Chile, Colombia, Costa rica, Dominican republic, Panama, Trinidad and tobago, Guatemala, El salvador, Honduras, Jamaica.